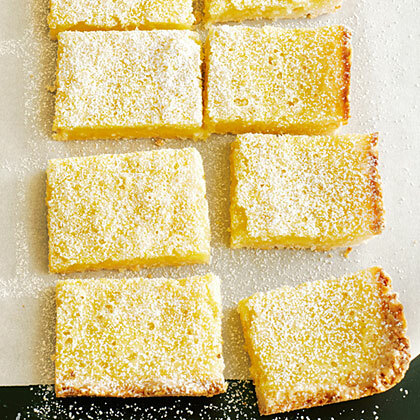 Toasted coconut in the crust and two kinds of citrus make this tart-sweet take on lemon bars rich and highly addictive. For bright yellow bars with flecks of zest but no foamy top, whisk the egg mixture just enough to blend. Preheat oven to 350°. Make crust: Pulse all ingredients except butter in a food processor. Add butter and pulse until crumbly and butter is in small pieces. Grease a 9- by 13-in. baking pan. Press crust into bottom and slightly up sides. Bake until light golden, 25 minutes. Let cool 20 minutes. Make filling: Whisk together flour and granulated sugar in a medium bowl, then whisk in eggs and citrus zest and juice just to blend. Pour over crust and bake until only slightly jiggly in center, about 22 minutes. Let cool, chill several hours or overnight, and cut into bars. Dust with powdered sugar if you like. *Toast coconut at 350° on a rimmed baking sheet until light golden, about 5 minutes.